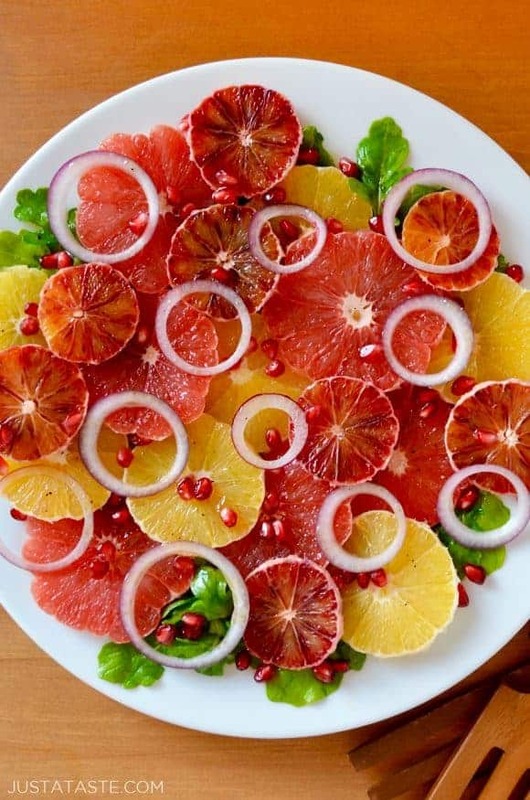 Add a palate-cleansing pop of color and refreshing flavor to your next meal with a quick and easy recipe for Citrus Salad with Honey Dressing. With Thanksgiving behind us and Christmas and Hanukkah ahead of us, should we take a minute for a little caloric breather? If you’re still feeling stuffed and have made your way through all of those re-worked Turkey Day leftovers (waffles! pancakes! muffins! 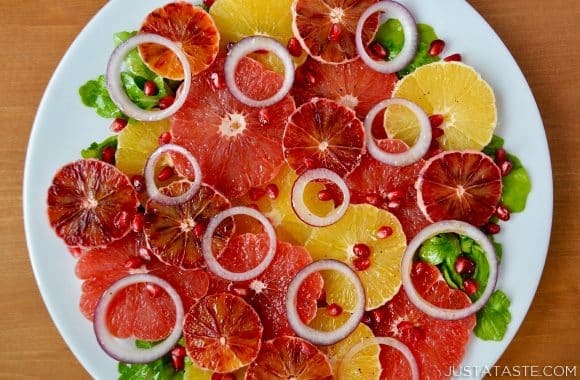 ), this bright and bold Citrus Salad with Honey Dressing is the answer to our my-spandex-pants-need-a-break prayers. Winter screams “Citrus all the things!” And this show-stopping dish is guaranteed to impress, thanks to the presentation. Peeling the citrus is the most time-consuming part of this recipe, but it’s important to remove as much of the white pith as possible to steer clear of any bitterness. 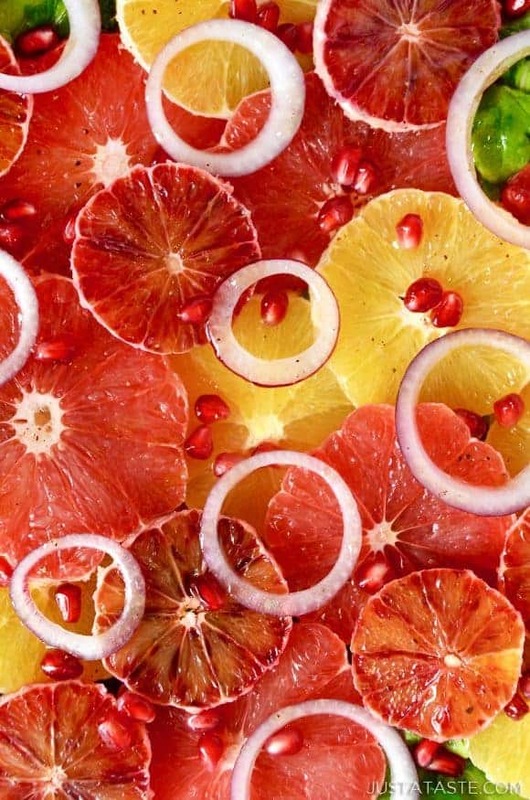 I’ve opted for a trio of oranges, blood oranges, and grapefruits to maximize on color and complementary flavors. A few thin slices of red onion add bite while pomegranate arils add a burst of juicy flavor and textural contrast to the plate. And to finish off your rainbow of flavor? A quick-fix honey dressing to balance out the sweet with the sour . This is a simple citrus salad that’s fast enough for weeknight meals but dressed up enough for weekend brunches or dinner parties. And just like your go-to little black dress, it can be as casual or as fancy as your heart desires! In a small bowl, whisk together the olive oil, red wine vinegar and honey. Taste and season the dressing with salt and pepper. On a large platter, layer the sliced oranges, grapefruit, red onions and arugula. Drizzle the vinaigrette on top then garnish with pomegranate seeds and serve immediately. 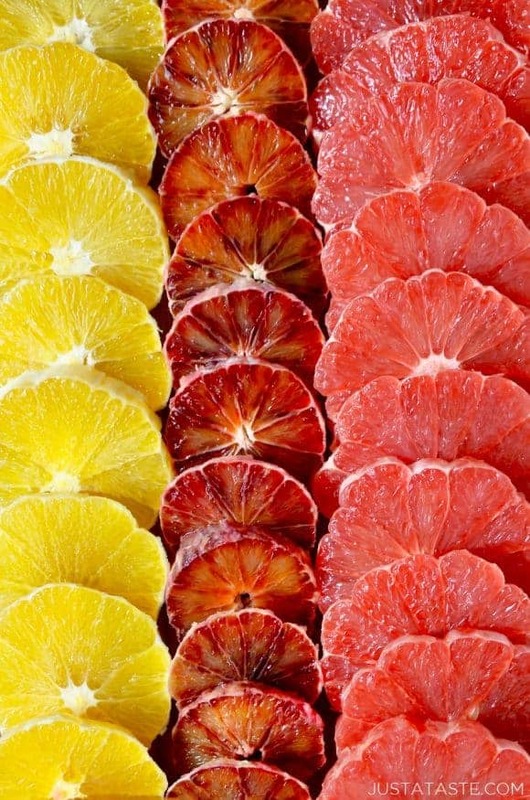 Remove as much of the white pith from around the citrus fruits as possible in order to avoid any bitter taste.